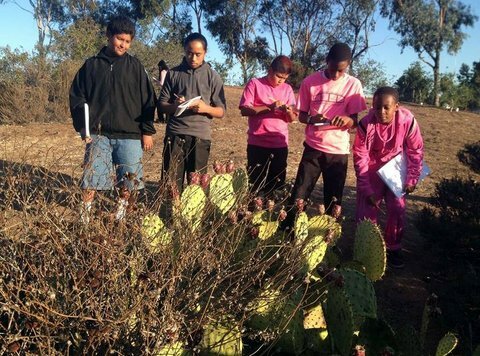 Millennial Middle School students at Groundwork San Diego’s Earth Lab, a new community greenspace for outdoor intergerational learning in Southeastern San Diego. The San Diego Science Project, part of the CREATE STEM Success Initiative, works with teachers to develop outdoor, hands-on science activities for students across curriculum. The launch of UC San Diego’s CREATE STEM Success Initiative is the top story in today’s This Week @ UC San Diego, the university’s online weekly news magazine. The article, “A Lever for Local STEM Education,” provides an overview of the initiative’s new model for networking UC San Diego’s renowned STEM (science, technology, engineering and mathematics) resources to the education community, to improve the region’s K-20 STEM education pipeline. Funded in summer 2013 by the Offices of the Chancellor and Executive Vice Chancellor, the CREATE STEM Success Initiative is off to a strong start. Initiative team members have met with more than 300 partners and potential partners to discuss new outreach and collaborative learning opportunities, focusing on high-need students and their teachers. Read the article to find out more about the initiative and who’s currently working together with the CREATE STEM Success team to improve STEM education in our region.